Readers familiar with the Troy Davis case out of Georgia might wonder what I'm doing posting about this on a DUI blog. Good question. For one thing, I focus on criminal defense in Illinois as well. For another, one of the great problems presented by DUI investigation and prosecution is a problem of general integrity in the legal system. Here we have just such a problem. Seven of nine key witnesses have recanted their testimony? When we, as a society, execute people, there must be no room whatsoever for doubt. Even if Troy Davis is guilty in fact, and not just in law, this is a failure of our system of justice and a blight on it's integrity. I'm not typically alarmist when I see stories claiming there's discrimination and racial profiling, but this one is more careful about it than most. Often, studies talk about who gets stopped. My problem with those studies is that they can't or don't account for neighborhood or regional composition. For instance, why would it be significant that a high percentage of Hispanic people are stopped for traffic tickets in Chicago in an area that is largely comprised of Hispanic residents? None. Contrast this with a recent study linked below that says something quite a bit more significant about traffic ticket enforcement in Illinois. This study is about what happened after the stop, and that's where the discrimination is suggested. To be fair, the Chicago Police Department comes off fairly well. The story is worth reading, and I welcome hearing your comments. Help! Canada won't let us in! One of my least favorite calls frequently happens around 2 or 3pm. Usually it's a young newlywed bride on the verge of tears. "We're here for our honeymoon and the Canada border people won't let us in because my husband had a supervision for DUI in Chicago four years ago! My hubby didn't even remember this! Can you do something?" [note - expletives deleted to protect my innocent readers]. Sadly, for the most part, the answer is no. You see, in Canada, DUI is a felony offense every time, and is a basis for exclusion from admission. The most I can suggest in this situation is to ask to speak to a senior agent that has the authority to override the exclusion. Planning ahead would help, and a call to the Canadian Consulate to determine eligibility for what our northerly neighbors lovingly call "rehabilitation." According to a recent article in the National Post about DUI exclusion, it would appear that Canada's tourism folks would prefer that exclusion based on DUI cases were perhaps a bit less rigid. We're thinking somebody told them that occasionally, hunters and fishermen (fisherpeople too) sometimes drink *gasp* alcohol. We'll let you know if we hear about any movement on this. Meanwhile, let us know what you think about Canada's policy for punishing newlywed brides for DUI arrests their husbands have already forgotten about. Evidence disallowed by the trial Judge shown in Clemens Criminal. Result? Mistrial. In any criminal court trial, the Judge decides what evidence is admissible and what is not - they serve as a gatekeeper. Nowhere is this more important that in a criminal Jury trial. The Court in Roger Clemens' criminal perjury trial decided that certain evidence was inadmissible and would unduly prejudice the defendant, in this case, The Rocket himself. This legal process of having the Judge serve as a gatekeeper of information is fundamental to our system of justice. The Judge is charged with preserving the integrity of the system, and most importantly, with assuring fundamental fairness. Nowhere is this more important than a case where freedom is at stake, like in a criminal trial or, you guessed it, a DUI trial. Why after a direct order would a prosecutor attempt to introduce the prohibited evidence or exhibit? What do you think? I haven't posted anything in a while and thought - what a great time for a story! Enjoy! 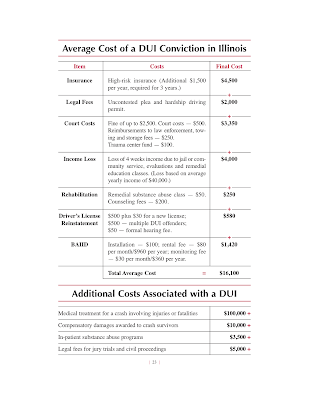 What does a DUI cost in Illinois anyways? Fagan, Fagan & Davis attorneys literally speak to hundreds of people charged with DUI in Illinois every year. Without fail, people ask one question: what is this crazy situation going to cost me?! Great question. While there's no stock answer, let's take a look at what the Illinois Secretary of State has to say on the subject. Click on the image and you can get a look at the Secretary of State's math. 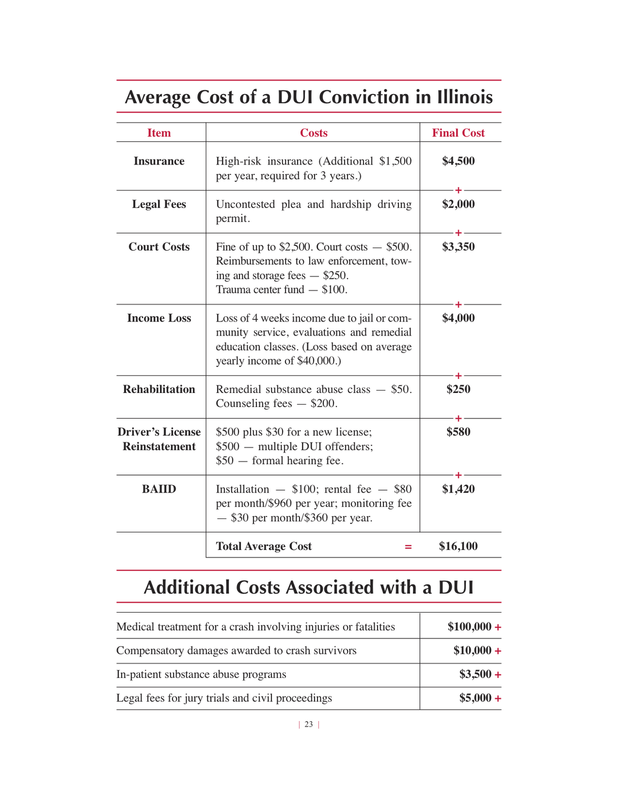 According to the Jessie White's office, the "average" cost of a DUI conviction in Illinois is over $16,100. We regularly do quite a bit better than this for our clients, especially when our representation results in dismissal of the charges. This chart anticipates hiring an attorney "uncontested plea" - meaning walk in and give up, we suppose. But whatever we might think of the Secretary's assumptions and calculations, that's one hefty price-tag! For an independent take on the structure of anticipated attorney fees for DUI, check out this take on DUIAttorney.com. A change is in the wind . . . er, breath. Illinois law regarding permits for those suspended based on an accusation of DUI has undergone it's first overhaul since inception in 2009. Illinois Governor Pat Quinn today signed Public Act 96-1526 into law. Until now, a motorist facing DUI charges in Illinois courts was able to apply to the Court for an MDDP, or Monitoring Device Driving Permit. This MDDP enables motorists suspended for either 6 months (if they submitted to chemical testing such as a breath test) or 12 months (if they refused breath, blood or urine testing) to drive for all but the first month with one significant restriction - that of a BAIID installed in their vehicle. BAIID is alphabet soup for a Breath Alcohol Ignition Interlock Device, and the idea is that the motorist provide a breath sample by blowing into the BAIID, which, assuming no significant amount of alcohol is detected, would allow the vehicle to start. Illinois law specifies (as it has for over decades in a comparable scheme previously employed called a JDP) that only first offenders as defined by suspension law qualify for the permit. Based on that statute, as well as case law addressing the issue clearly, for purposes of DUI-based suspensions of the sort we're talking about here, a first offender basically means someone who has not had a DUI within the previous 5 years. The problem was simple - a small group of Judges did not want the responsibility of being the gatekeepers issuing these DUI permits for those motorists who had any kind of DUI history, no matter when, no matter what the law said. If a motorist ever had a DUI, they refused to agree that the application was accepted. Some went further and refused to issue the MDDP for certain types of cases, higher breath tests for example. Never mind that the BAIID would prevent those motorists from driving with any significant amount of alcohol at all, they simply didn't want their names on those MDDP permit applications anywhere. The solution required by these very few Judges was PA 96-1526. This law eliminates the Judge from the screening process, and requires the motorist to deal with the Secretary of State directly. There is an argument that having one more gatekeeper in the process was a desirable thing, so whether this is a good idea for Illinois DUI law remains to be seen. It should be noted that these restrictions on a person's freedoms occur without any determination of guilt whatsoever. Before doing anything, anyone merely accused of committing the offense of DUI in Illinois should consult an experienced Illinois DUI lawyer, and that includes consulting an attorney before applying for an MDDP and addressing a summary suspension.